Studies investigating lesbian domestic violence show lesbian relationships to be more violent than other relationships. The Massachusetts News  a newspaper that covers the way homosexuals are taking over the schools and libraries. Here is the start of a collection of links to material or examples of letters that can be used by you in writing letters of your own to your favorite politicians and newspapers. It may be discouraging to some that a letter-to-the-editor that's been written about family issues gets rarely published if it has been written by a man. Furthermore, many papers have rules that prevent them from publishing letters from a given individual more often than once every few months. However, such letters don't get published at all if they are not written at all. Most importantly, every letter you write gets read at least by the editors of the newspaper or magazine you send them to. Marriage  Heterosexual Marriage is unique. Glenn Sacks' column "Men's Silent Health Crisis' Cries Out for Men's Health Act "
You don't have any, you say? Well, you better be concerned about them. About as many men die of cancer of the prostrate each year as women who die of breast cancer, yet, government funding for prostate cancer research is about a quarter of what it is for breast cancer research. Please give this some of your time if you live in the Edmonton area. Replies were required before the end of November 1998. The deadline is now past, but if you are looking for men's resources, contact the authors of the survey. The results of the survey have not yet been compiled. When that has been done the results or a link to them will be posted here. Paternity Issues  Paternity fraud runs rampant. In ostensibly stable, monogamous marriages the alleged father's child is not his supposedly biological offspring in one out of five cases. In contested paternity cases, as is customary for paternity in children born to single mothers, the chance that an alleged father is not the biological parent of a given child is one out three. Should you sign the birth certificate? Be careful, you may quite likely commit yourself to a life of servitude and financial slavery without having much of a chance of ever playing a meaningful role in the life of the child for which you have to foot the bill, even if the child is quite possibly not yours; regardless of whether you are married or not, whether you are in love or not. What if the child isn't yours? Are you sure it's yours? Chances are one or better against four that it isn't. Patriarchy  Was there ever such a thing? To claim that the patriarchy is a manifestation of a sinister, conspirational plot by men to subjugate and enslave women is to be in denial of women's power. Is it enough to poke fun at such an outrageous claim? Women's power was present and predominant throughout history. To deny that fact would be as dishonest and irrational as to deny that the sun shines throughout each day. Fortunately, beginning with Plato and with Aristotle in Politics, there always were writers and historians who took a somewhat more realistic view of the evolution of society and of women's controlling role in it. There are even feminist writers  women and men  who make it quite clear that women always were a controlling force and influence in society, contrary to the false claims that women were so suppressed throughout history that they were not even permitted to own property. The criticisms of the patriarchy boil down to nothing other than the wish to deconstruct social structures that are based on the foundation of the family. It is quite logical that the anti-family forces in politics target their hatred of time-honored moral traditions on the family and do that by focusing on liberating women from their biological constraints. First and foremost in that is to liberate women from the chore of their biological role of being the bearers of life. That is achieved through the promotion of sexual freedom (as in the Communist Manifesto) and of abortion "rights." That produces a big problem. By promoting the abolition of the family and of the biological role of women, we not only will bring about the deconstruction of family and "patriarchy" but the very end of civilization and of even humanity itself. The death of humanity is beginning with the rapid population decline in the developed nations. The abolition of the family in the developed nations has progressed to the point that fewer and fewer people are willing to bind themselves in holy matrimony or to remain in it for life, to the extent that fewer people are willing to have children by any means, married or not. In consequence, the developed nations are losing population at the rate of about 30 percent and more with every successive generation. All that will do is to obscure the fact that the total human population is in decline in the whole world. Caucasians are merely the first to go. The last UN Population Report identified a growing number of UN member nations whose birth rates are below replacement levels (84 in 1999, up from 61 in 1998), while the birth rates in most of the developed nations are about half of what they should be to maintain population levels. Is it necessary to abolish the patriarchy (that is, the family)? That depends on whether we want to help to achieve the goal of the proponents of negative population growth (read: the reduction of the human population) down to the size of the world population that existed during the time of Columbus. Some people estimate that world population levels were at around 300 to 500 million people then, although some, such as David Korten, put them at somewhat higher levels. Korten, who even mentions Malthus by name, gingerly endorses the goal of bringing the world's population down to 1-2 billion from the present 5.7 billion [in 1995], though without saying how. Malthus, at least, was honest enough to advocate the promotion of death: "Instead of recommending cleanliness to the poor, we should encourage contrary habits." Korten probably isn't a partisan of mortality-promotion, but advocating the disappearance of billions of people without saying how invites terrible speculations [not the least if which is that the AIDS epidemic is considered by many people to be a blessing that serves well in aiding to eradicate mankind from the face of Gaea WHS]. Is it possible to achieve the large-scale reduction in the size of the world population? Yes. It is even likely to happen. Current world population projections identify that by the year 2150 the world population will reach 3.7 billion. It only took to remove the weakest links from our families, the fathers. To make that possible, acceptable and even desirable, it was necessary to conjure up the notion of the patriarchy, of it being evil and a conspiracy by evil men, and to extend that thought to the idea that all men are evil and not providers and protectors for women and children but their Nemesis. Insane as that is, the rest was and still is easy. After all, the strategy of denigration, vilification and then persecution and even perhaps extermination is a time-honored recipe for success in the eradication of "undesired" sectors of the population. Although the Nazis used it successfully in the eradication of six million Jews and six million other "non-Aryans," the communist regimes during the last century applied it far more successfully, by murdering at least 170 million landowners, academics, capitalists and other "enemies of the State." As many as 98 percent of those murdered by the communist regimes were boys, men and fathers, leaving women and children to struggle for themselves, in the care of "Father State," as effectively (but obviously not as cheaply and profitably) as any state-sponsored and feminist-driven program of no-fault divorce could have hoped to achieve. We often have beautiful colours in the Fall. Usually that lasts until the end of September or early October. That's when sometimes the first truly severe frosts hit. It was lucky that we went for a little sight-seeing tour of our neighbourhood on September 30, 2000, because three days later the temperature went down to -10°C. Have a look at what things are like in Alberta at that time of year. Those photographs comprise 798 kB of data. If you want to display the associated maps as well, then there'll be another 206 kB of data. Photographs of our house, and various other things. That page won't take long to load. The pictures are shown as thumbnail images that can be clicked to display larger versions of up to about 50 kB each. Edward Bernays, a nephew of Sigmund Freud, thought and successfully promoted that propaganda is a necessary and powerful tool for running a democracy. Adolf Hitler thought and promoted much the same thing as the article at the preceding link illustrates. However, as the information accessible at the following links shows, just because Edward Bernays is now close to a hundred years old and just because Hitler is long dead, the progress of propaganda has not been halted. Propaganda is still very much and increasingly so at work and affects all of us, everyone in the world. The U.S. National Science Foundation, the U.S. Department of Commerce and their allies in Japan and Europe are hard at work to bring about their ultimate goal, to promote and establish a global hive mind by the end of the 21st century. They posit that not only is that goal feasible but also that it will quite likely be achieved during the course of this century. Not only will the hive mind have been constructed, it will offer the lure of immortality for all those who join it, give them virtually instant communication with one another and make them unimaginably powerful. That what makes us human and what comprises humanity, e. g.: individual personalities, will then no longer exist. There will no longer be the need to feel pain, hunger, lust and pride. Moreover, gone, too, will be the need for humans to reproduce sexually and to have any need for material possessions. How can that vision possibly fail? After all, it will save the globe, and the proponents of that vision insist that the end of humanity by transforming it into the hive mind is the only way by which the globe can be saved. Each year about as many men die of cancer of the prostate as women who die of breast cancer. Almost 200,000 new cases of prostate cancer will be diagnosed in 2001 in the US. Prostitution  Is it a form of violence? Against whom? Ever since the '20s the Canadian suicide rates for men were consistently higher by a factor of four or more than those for women. They reached an enormous peak during the Great Depression in the late twenties and early '30s, then fell again, to experience another sharp increase in 1945 and 46, and climbed once more in conjunction with the 1968 Divorce Act Reform. Along with the increasing vilification of men that began in the '60s, the suicide rate for Canadian men experienced a rapid increase that has only lately abated somewhat. Nevertheless, in 1971 the rates for men reached and then surpassed for a number of years the peak reached previously in 1930.It took until 1989 before the rates declined to that existing at the onset of the Great Depression in 1927. For men, three-and-half decades of "women's liberation" have been a traumatic experience. For the male victims of suicide it was a deadly experience. 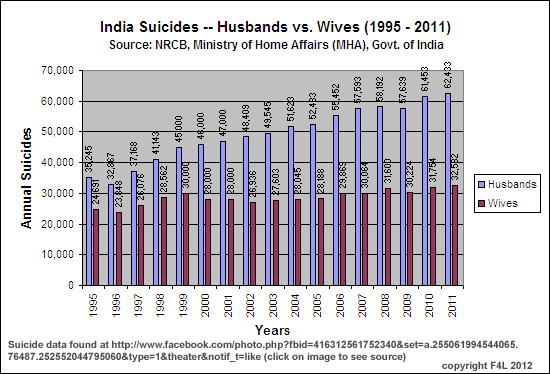 It is a common perception in India that men drive women to suicide. That is a major hoax created by Gender Feminists and Media Bias. Autor: Grupo Padres e Hijos. Madrid, 10 de Julio de 2004. The frequency of suicide continues to decrease and during the past two decades suicide mortality has decreased by 38 per cent for both sexes. 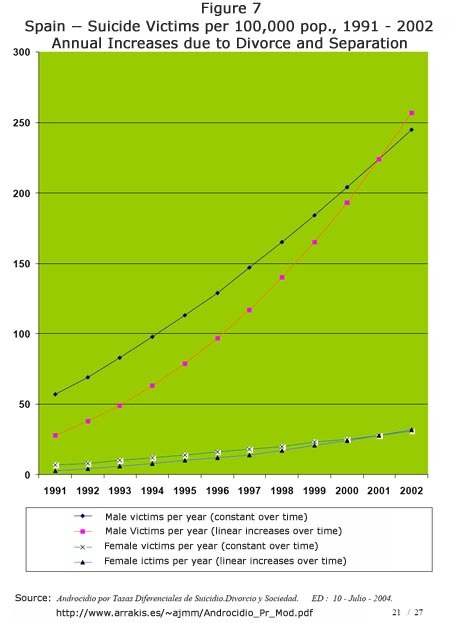 Suicide is commoner among men: during 1998 three times as many men as women committed suicide. 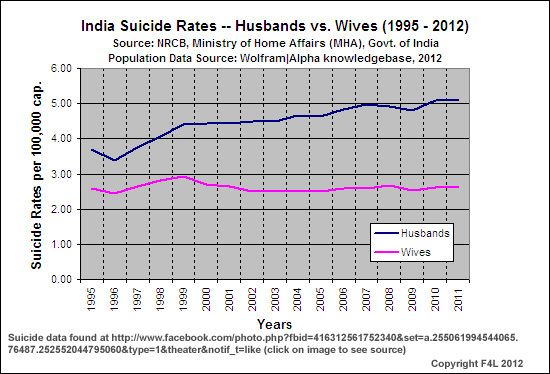 On the other hand, suicide attempts are commoner among women than among men. Eeva Sodhi, who provided that item of information, comments: "That basically coincides with the time (1983) when joint custody became the norm [in Sweden]. Since 1998 joint custody can be ordered even when one of the parents disagrees." The Mobbing Encyclopaedia. Bullying; Whistleblowing. Epidemiological FindingsLong-term effects: A greater proportion of these mobbed employees (the study indicates roughly ten to twenty percent) seems to contract serious illnesses or commit suicide. Leymann (1987) points out that about every 6th to 15th officially noted suicide in the Swedish statistics (in all about 1,800 every year) may be caused by this kind of workplace problem. 80% of the patients at the now defunct Swedish special clinic for mobbing victims had suffered from suicidal thoughts, 25% of those had made an attempt. Would the special Swedish clinic for mobbing victims be defunct if the majority of the victims were women. Yeah, yeah, I know. Men don't cry (but that is why they die). USA Suicide Deaths, during the period 1979 to 1996  of more than 500,000 suicide victims, four out of every five were men, and their numbers are increasing year after year, whereas those for women are steadily decreasing. Prof. Diego de Leo identifies that annual suicides in the world are in the order of one million, and estimates that the annual total will increase to 1.5 million by 2020. World wide, men and boys comprise close to 80 percent of suicide victims. There is hope that life will be better again, even though it seems that you have no longer any control over your life. You can have a reasonably good life. Whether the quality of that life will be good depends to a large extent on you. Many men feel that it is their right to be able to live with someone they love. It is your right. However, you have to determine what brought about the calamities that your divorce caused you. Marriage is an unenforceable contract. The odds are about 50/50 that a first marriage will last for life. The odds are against you that you'll do better the second time around. The third time around they are worse yet. Some people say that marriage is the main cause of divorce. That sounds very smart but isn't quite true. Many marriages fail because of the poor choices men (and women) made in choosing a partner for life. The following items delve into some of the things that will cause remorse. From Canada: Whose decision was it to file for divorce? From Canada: By Glenn Cheriton of Men's Health Network. Report on taxation of child support C69 to C92. The fallacy of sexual freedom. Any man who feels that there is such a thing as sexual freedom for men runs the risk of a very rude awakening. Nevertheless, many men take that risk, especially after separation and divorce. Be careful, be very careful! And the following items are intended to help with making the best out of the rest of your life, to some extent, to help you survive. Advice for your life after divorce  by Andrew Carlan, a man who was there, and who became a Fathers Rights activist and a lawyer on account of it. How to get by after having had your income reduced to next to nothing  a few tips on how to save on expenses and still be able to live reasonably well. Many men find it difficult to ask for help when they are depressed - it can feel unmanly and weak. It may be easier for men to ask for help if those who give that help take into account mens special needs. TOUCHY SUBJECT, an article by Lynley Hood in the NZ SUNDAY STAR-TIMES, 25 March 2001, focuses on a part of history in which feminism played a large part. The article deals with the evolution of the modern child-sexual-abuse witch hunts in New Zealand. There are, of course, international connotations. Jim, from New Zealand, wrote to me and sent me a URL for the NZ Government's Agenda for Children. All UN conventions are somewhat deceptive, but none more so than those that pertain to rights and issues relating to the family. It was not clear to me whether Jim was for or against the UNCRC [UN Convention on the Rights of the Child], but just so there will be no mistake on what the convention is all about, I wrote to Jim. The book from which the excerpts accessible here were made is a book about the history of the violence, depravity and cruelty of hundreds of thousands of women in Germany who actively participated in the atrocities committed by the Nazis. It is a history that is being swept under the carpet, ever since the end of World War II. These women were Nazis of the worst kind. They were active members of the SS, active in the concentration camps, visiting their husbands there, living right at the edge of the camps  knowing and willing perpetrators of atrocities, and providing moral and ideological support for their SS husbands. A Wife at His Side (by Gudrun Schwarz) is a contribution to the dismantling of the picture of woman as victim of circumstances, which  supported by research, justice and politics  could establish itself in German post-war society. The SS is being perceived until today as a male confederacy. To the contrary, Heinrich Himmler thought of and formed it as a clan-community comprised of men and women. In 1929 already, shortly after taking office as Reich-Leader of the SS, Himmler said about the SS clan-community that it was intended to be a "racial top-stratum of a Germanic people," a leading elite of a Europe ruled by the Nazis. Why do so many people have such a time accepting that women are as fully capable  of good, of evil, of everything in between  as men and thus as deserving of the same judgments? The evidence is all around us, from the pack of predominantly girl teens who set upon Reena Virk in Victoria, B.C. [and cruelly killed her], and who showed the few boys there how it was done, to Amina Chaudhary, who casually strangled the eight-year-old nephew of her then-lover, to the two women who one August night last year killed Toronto Police Detective-Constable Billy Hancox with a knife to the chest, to the women everyone knows who are every bit as venal, or immoral, or heartless as any of their male counterparts. Homolka didn't need a man to turn her bad. None of us does. Women's Violence, SS-Wives and Karla Homolka tries to examine what kind of forces are at work that drive society to be in denial about women's violence. It attempts as well to identify some of the consequences of that denial. Victimhood has become a profitable enterprise. It is of great benefit to lawyers who fabricate victims and to the victims they fabricate. Victimhood is by no means being monopolized by women, although they are doubtlessly the primary beneficiaries of the victimhood-sector of the legal industry. Take the children in Norway that were fathered by German soldiers during the occupation by the Germans during Second World War. 1) Who works the most hours (inside or outside the home) in the average family unit worldwide? 2) Who does the most demanding and dangerous work?